This is one big, sprawling wine region. 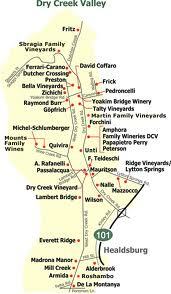 Unless you’re a wiz with a tablet map, buy a paper one, preferably with wineries tagged on it. Use it to find a base. Santa Rosa is right in the middle of the county but has little character for visitors; it basically could be any California city. I much prefer the areas around Healdsburg or Guerneville – for wineries, restaurants and scenery – but the town of Sonoma works if Carneros or Kenwood wineries are targets, and for easy access to the south end of Napa. Driving tips: There’s always a lot of traffic in and around Santa Rosa, but no way to detour around its edges, so just allow for extra time … Dry Creek and West Dry Creek Road are different (but nearby) routes, both narrow and gorgeous; on the snaky, rail-thin latter byway, you’ll really feel like you’re in farm country. … As for Eastside vs. Westside Road, don’t ask because I can’t tell. Places that I can personally tout include the more-than-serviceable Best Western Dry Creek Inn in Healdsburg, Zinscape in the Dry Creek Valley (attached to a home) and River’s End in Jenner. All are reasonably priced and good values. The last one is a remote gem, completely off the grid with no TV or cell-phone coverage, where the Russian River glides into the ocean. We’ve also found great places at nice prices through Vacation Rentals by Owner. For those with the moolah, the Hotel Healdsburg is well worth a splurge, a casual-chic enclave with wonderful service and all the comforts. Plus a stellar restaurant helmed by the estimable Charlie Palmer. Downtown Healdsburg has an outpost of Napa’s classic Oakville Grocery (124 Matheson St., 433.3200), more upscale than the original but packed with gems. Down in Sebastopol lies one of my favorite food marts in the world, Andy’s Market (1691 Gravenstein Hwy., Sebastopol), with an astounding produce selection, beautifully chosen wines and dry goods out the yin-yang. And if you’re down Sonoma way, do not miss one of the planet’s greatest cheeses, the dry Jack at Vella Cheese Company (315 Second St. E., Sonoma).